Hudson-Odoi in action for Chelsea against PAOK in the Europa League. CHELSEA MANAGER MAURIZIO Sarri does not think joining Bayern Munich would be a good move for Chelsea starlet Callum Hudson-Odoi. Bayern have made several offers for the for the talented teenager — the most recent one worth £30 million — and are determined to not miss out on another promising English prospect after seeing Borussia Dortmund sign Jadon Sancho from Manchester City. Chelsea boss Sarri is adamant staying put is a better option for Hudson-Odoi, however, predicting a bright future for him at Stamford Bridge if he stays. I know, for me, he is a very important player. He’s young, but he’s improving. He played really well in the last match. “At the moment, I want to understand the situation, if he wants to go or not,” Sarri said. Email “'To stay here is better': Sarri warns 18-year-old Hudson-Odoi against £30 million Bayern move”. 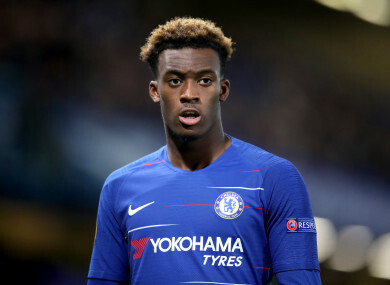 Feedback on “'To stay here is better': Sarri warns 18-year-old Hudson-Odoi against £30 million Bayern move”.